[XPB-ULNBXPER] The U-Leg Perforated Backless Bench is constructed entirely in metal with 3" 11-gauge steel Legs and pre-drilled mounting holes. 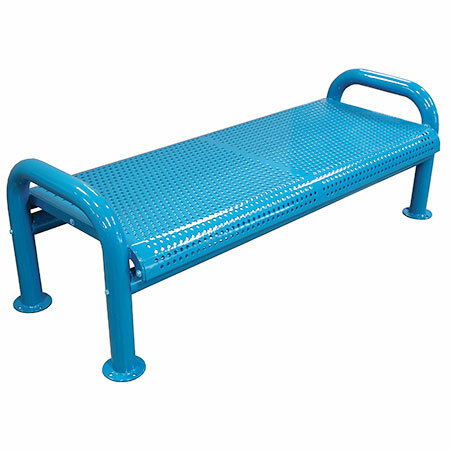 Perforated U-Leg bench is coated in Thermoplastic, a durable weather resistant finish, and available in 16 color choices (see Color Selects). U-Leg bench is available in 4 Ft., 5 Ft., and 6 Ft. Lengths (See Bench Choices).The Thermoplastic coating make these benches great for indoor lobby and entryway seating or as an outdoor garden bench. Compliment your bench with matching Receptacle sold separately. For shipping quotes, discount pricing, orders or questions please call our Customer Service Center at 1-877-483-9270.